One of the most common guitar configurations is drop C tuning. However, while many guitarists know this tuning is popular, not many are aware of how useful it can be in their repertoire. However, this tuning doesn't make certain elements, such as bar chords, very easy. That's why "drop" tunings were invented. The drop C tuning also provides a heavier sound with a more full-bodied bottom line. Many popular rock, metal, and alternative songs are written in a drop C or a drop D tuning. 6th string (lowest sounding string): Tuned to C below the low E of standard tuning. As you're playing the low E into the tuner, turn the tuning peg down to lower the string's pitch until the tuner says "C."
5th string: Tuned to G, a whole step below the A of standard tuning. As you're playing the A into the tuner, turn the tuning peg down to lower the string's pitch until the tuner says "G."
4th string: Tuned to C, a whole step below the D of standard tuning. As you're playing the D into the tuner, turn the tuning peg down to lower the string's pitch until the tuner says "C."
3rd string: Tuned to F, a whole step below the G of standard tuning. As you're playing the G into the tuner, turn the tuning peg down to lower the string's pitch until the tuner says "F."
2nd string: Tuned to A, a whole step below the B of standard tuning. As you're playing the B into the tuner, turn the tuning peg down to lower the string's pitch until the tuner says "A." 1st string (highest sounding string): Tuned to high D, a whole step below the high E of standard tuning. As you're playing the D into the tuner, turn the tuning peg down to lower the string's pitch until the tuner says "D."
As you play in a new tuning, the strings can sometimes stretch and go out of tune. 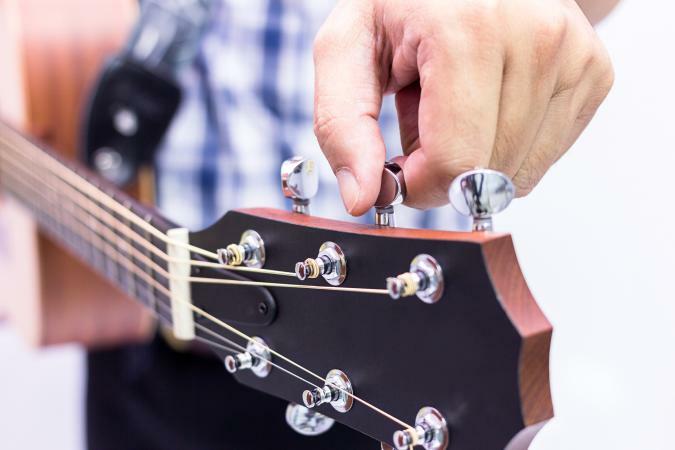 Play a few chords using your new tuning and continue to check each string with your tuner periodically until the guitar stays in its new tuning no matter how much you play it. Here is a video that details the tuning process with a tuner, and it also shows you the new tuning layout as it relates to each string. If you don't have a tuner and you're not able to play along to the video above, there is a way to switch to and from drop C.
When in standard tuning, play a note on the third fret of the 5th string, a C note. Tune the 6th string, the low E string, to match this note until it is low C an octave below. Once you have tuned the 6th string to low C, place your finger on the seventh fret of that string, a G note, and play it. Now, tune the 5th string to match this note you are playing. Once you have tuned the 5th string to a G, put your finger on the fifth fret of that string, a C note, and play it. Tune the 4th string until it matches the G.
Once you have tuned the 4th string, put your finger on the fifth fret of that string, an F note, and tune the 3rd string until it matches the F.
Once you have tuned the 3rd string, put your finger on the fourth fret of that string, an A note, and tune the second string until it matches the A. Once you have tuned the second string, put your finger on the fifth fret of that string, a D note, and tune the first string until it matches the D.
Once these steps have been completed, your guitar will be in drop C.
New tunings can be fun and exciting, and you can make good use of your new tuning. Learn the new chord fingerings for drop C tuning. As you explore an in-depth chord chart site for drop C, you will find many of the chords that were difficult to play in standard, such as the barred chord F major, are easier in drop C.
Take the standard chord fingerings you have learned to play in standard tuning, and play them--completely unaltered--in the new tuning. You will find these old, tired chord fingerings yield surprising, intriguing, and sometimes even bizarre or beautiful results in the new tuning. You may even stumble on new tone colors to enhance your songwriting and jamming. As you learn well-known songs that were written for drop C, you will become used to the sound and feel. You can then use the drop C tuning as a starting point to create your own alternate tuning. Drop C is most often used in rock and metal because its low tunings produce tremendous growl and power through a distorted electric guitar. However, in less grungier rock such as Rush, drop C is also used because it creates harmonically rich, full-bodied sounding chords. The following three examples demonstrate these traits. You can view tablature for this drop C song, and listen to the song by playing this video. You can view tablature for this modified drop C song (with two strings slightly altered, as you'll see in the tab), and listen to the song by playing this video. It's true tuning the guitar in any context, whether standard or alternate tunings, can be tedious. However, it is a necessary skill to master if you want to become a mature musician on your instrument. Learning to tune drop C is a challenging but helpful exercise to take your guitar wizardry to the next level.